Thanks in part to the proliferation of easy to use, cross platform scripting, or compiler-less languages, we are in a wonderful world where the exact same applications truly can be available on Linux, Windows and Mac. This is making it even easier for people like you to switch to Linux and experience all the great things that have been holding people back. In the many years that the operating system ‘wars’ have been going on, another war of sorts began: mobile messaging apps. This doesn’t just include SMS and their Internet based equivalents, but instant messaging like Slack, Google Hangouts, even E-mail like Google Inbox or GMail, has become in part, more like a messaging platform than a traditional email client. Whatever way you cut it though, there are just far too many ways to communicate with folks out there these days. Worst of all, you could be missing out on the things your family and friends are saying, because you don’t have that particular messenger app installed. There’s just too much, maybe you need one messenger app to hold all the other messenger apps! That’s pretty much what Rambox is trying to do. It’s free, open source and it’s available right now, and from what we’ve been able to see so far, it works! It uses web based technologies only. This means that the messenger or e-mail service that Rambox can support must provide a web interface, or a web API. Skype for web is new on the scenes, but already Rambox is supporting it, WhatsApp web is too. In fact, we have already tried it successfully Facebook Messenger, Gmail, Skype, MightyText (the Android app that puts SMS’ on your computer), and TweetDeck. 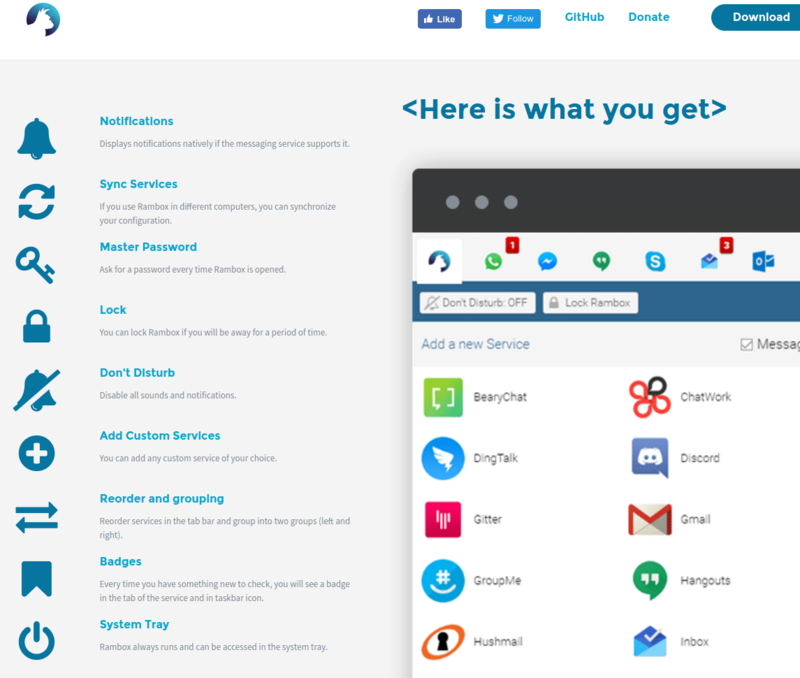 In All, there are 72 messaging services that Rambox supports at present (as of September 28th 2016), and as they are all the web based versions, direct from each of the respective service providers, they all act in the way you would expect them to. They seem to be adding more services all the time. Whilst it’s not the utopia that one day, we hope might happen (although probably won’t! ): A unified messenger that has only one messenger service, that sends to all other messenger services, it’s probably as close as we are going to get to that. Rambox is well executed, good looking, and it works across Windows, Mac and Linux. Open Source and not Commercial? For how long?